In an attempt to take the initiative out of the hands of the US and its Arab allies, Russia has undertaken its biggest intervention in the Middle East in decades, with a series of air and missile strikes in Syria and its neighbourhood. But the claims of Moscow that it was targeting the fighters of the Islamic State were disputed by the US, with Pentagon officials claiming that Russia’s strikes were aimed at supporting the beleaguered Syrian president Bashar al-Assad and his regime. However, despite all the military punch that Russia may be willing to pack, this conflict, which is already over four years and could go on for a few more years, brings Russian and American troops close to each other in over a century, and could be the start of another Cold War. Since re-assuming the post of Russia’s president, Vladimir Putin has lost no time in addressing the geopolitical threats to Russia internationally, first with Russian troops marching into Crimea, and now at the centre of his agenda is the explosive situation in the Middle East. 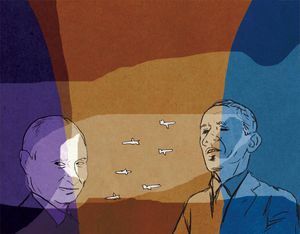 Putin has drawn a line in the sand around the survival of al-Assad and his regime. But it is not just Syria that Putin has his eyes on. It is also in preserving the port rights to Russia’s only Mediterranean naval port at Tartus, which could become strategically important if there is a showdown with the US and its NATO allies. Russia’s intervention came after a US scheme, to train Syrian rebels to fight Islamic State militants, had ended as a total failure, as admitted by a US general who was involved in this hare-brained initiative. The US congress had funded the $500m programme to train and equip over 5,000 rebels as a key plank of US strategy against the Islamic State, which President Barack Obama had reluctantly approved. But many of these trained fighters have since turned over their gear, ammunition and possibly weapons to the Al-Qaeda-linked Al Nusra front operating in northern Syria, for fear of being attacked and to get a ‘safe passage’. Apparently, there are only a few hundred Syrian rebels left from the original lot of fighters trained to fight the Islamic State militants, who number more that 20,000. The Middle East is thus torn apart between the historic states in the heart of the Levant—Syria and Iraq—and has an ongoing conflict in Yemen, where the allies of Sunni Islam led by Riyadh are fighting the representatives of Shia Islam. However, unlike Obama’s positive overtures towards Iran and Cuba, his reluctance to play a pro-active role in the Middle East, after the reversal over his Syrian chemical weapons ‘red line’ in September 2013, has destroyed what little credibility Obama had in the region. With no solution in sight to the four-year-long war in Syria, there are millions of refugees from Syria scattered throughout the region, making them the world's largest refugee population under the United Nations' mandate. There could be more than four million Syrian refugees by the end of 2015—as per UN predictions—the worst exodus since the Rwandan genocide 20 years ago. What must be of concern to us in India is the impact on the millions of Indians residing in the increasingly volatile Middle East.